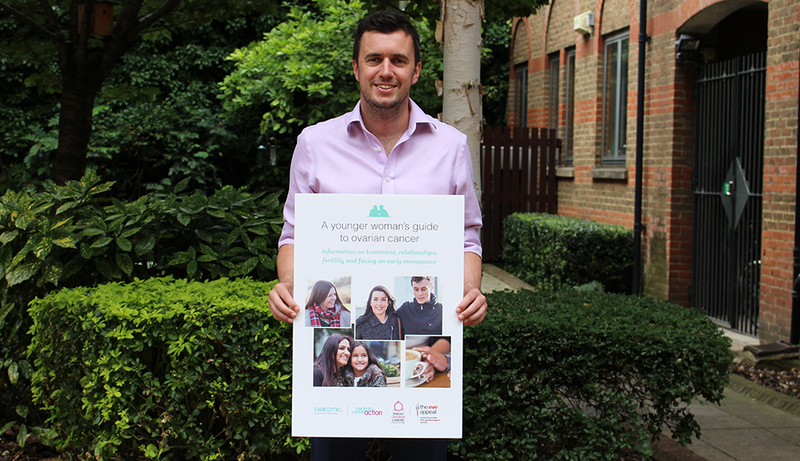 This week sees the release of our updated A Younger Woman’s Guide to Ovarian Cancer. Our Healthcare Projects Manager Ross, who was recently involved in reviewing the booklet, highlights some of the issues that younger women may face. With 82% of ovarian cancer cases diagnosed in women over the age of 50 it is often thought of as an older woman’s disease, but it’s important to remember that it affects younger women too. The number of under-50s diagnosed with ovarian cancer is on the increase, so it’s vital they are supported and have access to information that is appropriate for them. Being diagnosed with ovarian cancer as a younger woman is likely to bring with it the typical feelings of anger, confusion and fear that any other cancer diagnosis would, but there are many other factors that will need to be addressed as a woman progresses through her journey. Women diagnosed with ovarian cancer at a younger age face the possibility of surgical menopause if they have both their ovaries removed. Unlike when it occurs naturally, the onset of surgical menopause symptoms will be instant and mean that many women will need to make decisions around things such as HRT much earlier than they would usually have. The possible removal of both ovaries, fallopian tubes and possibly the womb also impacts fertility. Some young women will receive their ovarian cancer diagnosis before they have even thought about starting a family, and are suddenly faced with the prospect of not being able to conceive naturally. Discussions will have to take place about their fertility needs and what options are available. The symptoms of the disease, side effects and consequences of treatment, can have a significant impact on women’s confidence and self-esteem. Scars and long term effects of surgery can leave women image conscious and things such as nausea, vomiting and the possibility of hair loss that often come with chemotherapy can severely impact on how a woman looks and feels. There are also the practical consequences of an ovarian cancer diagnosis to consider. Recovering from surgery and possible need for subsequent chemotherapy will affect ability to work, and there may be childcare and emotional factors to think about too. These are just some of the issues that a younger woman diagnosed with ovarian cancer may have to face. Our guide, written in collaboration with Target Ovarian Cancer, Ovacome and the Eve Appeal, is there to help support women through their ovarian cancer journey, give them the confidence to help make those difficult decisions, and help ensure relationships with partners and family remain strong during this challenging time. Download A Younger Woman’s Guide to Ovarian Cancer. Information about types of treatment, the long term effects and how to talk to your family about your diagnosis. "When I was first diagnosed with ovarian cancer I was scared about the implications for my fertility"
Louise Temperley was diagnosed with ovarian cancer in August 2011. She shares her story and her journey to motherhood. "At 19 years old cancer wasn't something I thought I'd have to go through"